Some days the sun just doesn’t want to come out for you. I don’t know why. I guess it feels disagreeable on occasion, like the rest of us. Or maybe it was just feeling camera shy today. The point is, on those days you’ve just got to make the best of things. Or make banana bread. Hey, the sun will come out tomorrow, right? This recipe is adapted from Hungry Girl’s version. This banana bread isn’t completely fat-free, so it’s not gummy like versions that use only applesauce instead of oil. I made my bread into muffins, but if you like loaves better you can simply pour the batter into a bread pan and bake it about the same amount of time. Both HG’s and my recipe have about 160 calories per serving (one muffin or one slice of bread), plus more fiber and less fat than is traditionally found in banana bread. I bet the bread would be even better with a little cinnamon dashed in. 1. Preheat oven to 350 degrees. Spray 8 muffin cups with nonstick spray, or use liners. 2. Combine dry ingredients (both types of flour, sweetener, brown sugar) except for chocolate chips in a large bowl. Mix well. 3. In a medium bowl, combine egg whites, butter, and vanilla extract. 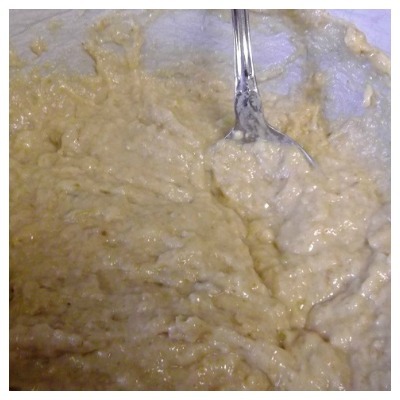 Whisk until uniform, then stir in mashed banana. Add liquid mixture to the large bowl, stirring until uniform. The batter will be thick. 4. Stir chocolate chips into the batter and pour into muffin cups. 5. Bake until a toothpick inserted into the center comes out clean, 20 – 22 minutes. 6. Let cool completely, then eat. Makes 8 servings. I can't wait to try these! Yum! This looks delicious! I bet my kids would love these. They're muffin nuts! Looks yummy! Gonna try this recipe, thanks! Yum I have to try these! They look very moist! Thanks! Totally need to make these, super-yummy looking and love that they are low calorie! YUM those look so good! My kiddos would love these! 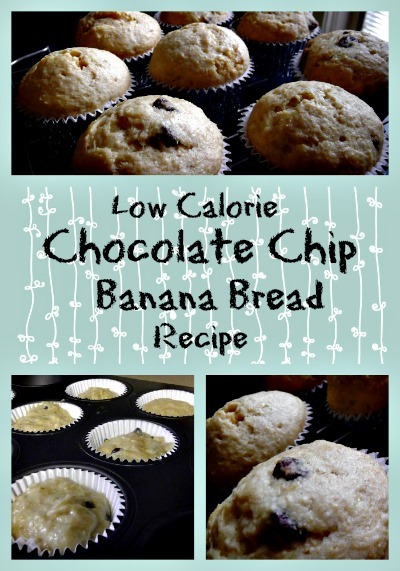 I don't usually care for banana bread but these look amazing and they are low cal… might have to try them! These look delicious!!! I love the combo of banana abd chocolate! Oh these look SO yummy! I am so sad that I am allergic to bananas 🙁 I love them so much but they do NOT love me! What a great recipe! Low cal and chocolate – I am so making these muffins! Looks great I would love to try making this. These sound amazing! I love that they are low in calories! They will work perfectly on my current weight loss program! I'd love to taste it. it looks amazing. I just had some bananas go a bit too ripe and are in my freezer right now! So excited to try this! I found your blog through a fiveaway post on FaceBook. I look forward to exploring and browsing your site. Thank you for sharing such great recipes! Banana bread & muffins are fulfilling as is. So a combination into this recipe is very interesting indeed. May try this soon. I wonder if I can exclude the sweetener & still have a super tasty muffin.. This sound so good! Going to give it a try! Chocolate chip banana bread sounds really tasty. I occasionally bake banana bread with nuts but not with chocolate chips yet. I might try it one of these days. Mmmm, gotta give this recipe a try! I made these today! Only saved 4 for my husband! What an easy recipe.. I'll be making these all of the time now. So glad you liked them! They are so easy and yummy! This look yummy! Will be trying them soon! I made these this psat weekend! Super yummy!!! It looks and sounds delicious especially with the chocolate chips. How can this possibly be low calorie? These look delicious! Thanks for the recipe, I'll have to try it! These look and sound so good! AND they're low calorie! I have to make them! Thank you! 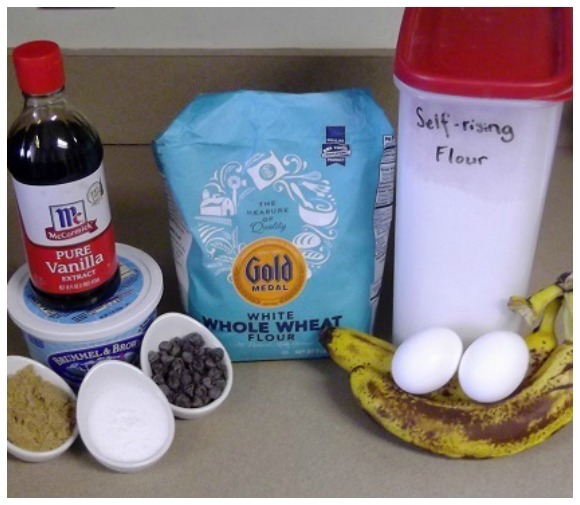 I have never evn thought to try to make banana bread healthier….lol. I like your simple changes. Best thing is you said it's not gummy like a lot of "healthy" versions of things. I usually make loafs but I think I do muffins next time! Made this dessert for my parents! Especially for my dad who loves banana bread! These look so good. I'm putting the ingredients down for my next shopping trip. Thanks so much! I'll have to try them. I'll bet the banana makes it moist. Sounds good. I love chocolate chips and banana's and this looks so yummy on your tummy good. Gonna try this looks great! yummy! 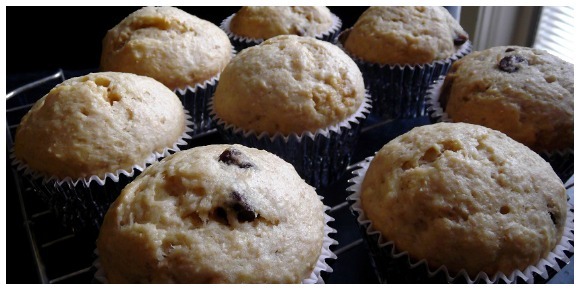 I love banana bread or muffins.Anything with bananas in it,I love it! I have been looking for a low calorie banana bread recipe and finally found it. Thank you!! Wow, These look amazing, I will obviously make these tonight and enjoy. I make a similar recipe to this and I add walnuts. So good with a cup of coffee or hot teat! Thank you sooo much for this recipe! Bananas and chocolate are two of my favorite things, but I am post bariatric surgery, so low calorie is perfect!! i am doing south beach diet and can actually have these in moderation! finally something sweet that i can have to eat that looks yummy! Those look yummy. I usually make most baked goods vegan but this is a good recipe to veganize. I like your vegetarian section. Thank you so much for the recipe ! I am going to give these a try. thanks for the recipe.. i have some ripe bananas that the kids wont eat.. I think that I will go to the store and get some chocolate chips and try this recipe. Wow…I can't wait to try these…and my kids are going to love them! Thanks for sharing. i have been on a diet and these would be something i could have once in a while – thank you for posting! I love banana bread. I heard about the applesauce version in a nutriton class but we never tried it out. I never thought to use butter spread because its not something I generally cook with but I will have to try it. This look tasty. I think I'd add a few chopped walnuts or pecans. I like to make cupcakes or muffins more often than cake. The single-serving cakes can be frozen and easily defrosted and there is no need to eat a whole big cake in a few days time. This looks delicious. I have been on the lookout for some lower calorie versions of our favorites. These look so yummy and combine my daughters 2 favorite things, chocolate and bananas. This looks really good and super easy! I think my picky daughter would enjoy these! May have to add this to my shopping list for tomorrow! Yum this recipe looks delicious. Anything chocolate chip & banana and I am sold. Thanks for sharing. YUM! This is way healthier than my banana chocolate chip muffin recipe. Can't wait to try it! My sister woukld love these. Gonna try them! These look delicious! My family loves the banana/chocolate chip combination. Will have to try these. These look and sound so good. I'm going to try them out. That sounds like a great recipe. I like that applesauce is used. The bread is probably super moist. These look soooooo yummy! I think I would try it with loaves instead of muffins. Thanks for sharing the recipe and your tips. WOW low cal I can't believe it I have gotta try this one thanks for posting. Nice !! I have been looking for a good banana bread recipe for a while. Will have to make these to bring to Thanksgiving dinner. Wonder if they would taste good with a little chocolate frosting on em too ??? I will be trying th is soon. sounds good. i love banna bread !!!!!!!!!!!! Thanks!! Looks delish! Love the way you posted pictures as well and!! This sounds great, thank you for sharing this with us. This looks delicious, I’m glad to know that it’s low calorie. I can’t wait to try this, thank you for sharing this recipe. Those look so good! banana bread is one of my favorite sweets! bookmarked! !, I like youur website! I have to admit that this is the best banana bread recipe so far! I simply love it. I think I will give it a try soon and since I can’t deny adding strawberries to it, I will substitute the chocolate chips with dried strawberries! 🙂 Thank you for the recipe! It is a good recipe! Healthy and fast cooking. With cup of tea, those cookies will be a delicious breakfast! I’ve baked a low-calorie banana muffins before.. I didn’t add a self-rising flour because it’s hard to find here in our place. So what I used was an all purpose flour instead. But this one deserves a try. I must look for a wheat flour then. These look so tasty. I think they would make a nice breakfast when I am on the run. I will make these soon to add to my morning breakfast rotation. This looks delicious! I think i’ll have to try this out sometime. I love Banana Bread, and I love the fact that this is low calorie. Thank you for sharing, will definitely try this. Oh my goodness these look delicious! I count calories and this will be on my meal plan now!